Cup of hard-paste porcelain. Decorated in relief with The Deluge and the Triumph of Neptune. Neptune is in a car drawn by sea-horses and surrounded by Tritons and Nereids. 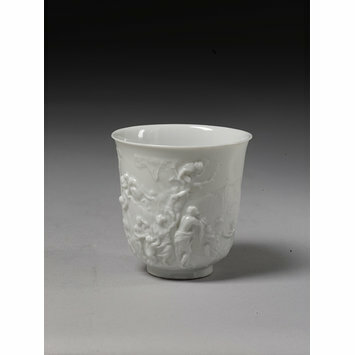 Cup of hard-paste porcelain, Doccia porcelain factory, Doccia, early 19th century. 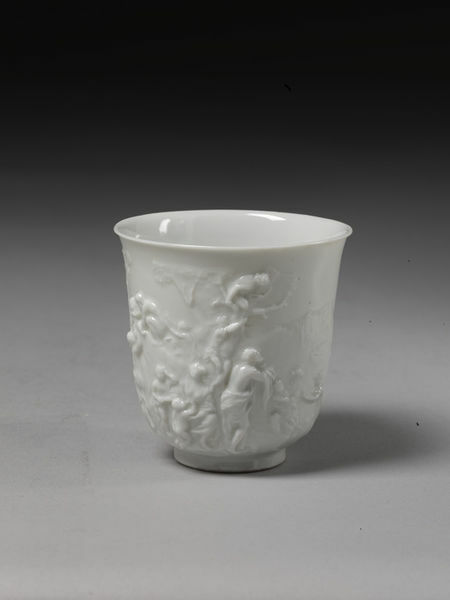 Cup of white porcelain with bas-relief scenes. The cup has two scenes representing the myth of the flood that the divinities on Olympus send to the Earth to destroy all men except Deucalion and his wife Pyrrha. The first scene is based on an engraving of Le Déluge universel (BANIER 1732, vol. I, p. 16) from an idea Godfried Maes, made by Jan Wandelaar; the other one is based on an engraving Of Neptune calme les flots (BANIER 1732, vol. I, p. 19), made by Philip van Gúnst. The lead plaques that were used to make the reliefs are in the Museo di Doccia (inv. 6456, 6458). When the cup was purchased it was attributed to Capodimonte. For further historical information, see cat. 17.